These handouts all focus on the different elements and components of stories. 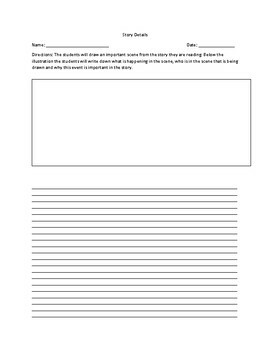 The first handout includes a series of questions in which the teacher can guide their instruction based on what story the students are reading at the time. 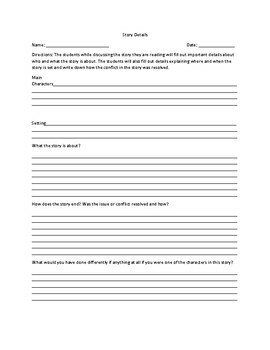 The second handout will allow the students an opportunity to visually reconstruct a scene from the story they are reading and also the students will also write down the characters and events that are taking place in the drawing they created. 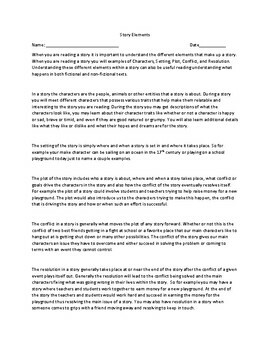 The third handout gives basic information on the five main components of a story Characters, Plot, Setting, Conflict and Resolution. These handouts can either be used independently by the students or the teachers can go over each step guiding the process of understanding story details and elements.